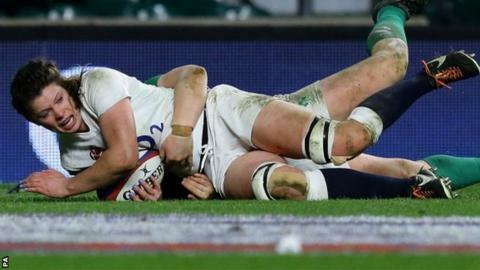 England extended their winning start to the Six Nations championship to three games with a tense 13-9 success against 2015 champions Ireland at Twickenham. A 62nd-minute try from lock Abbie Scott proved the decisive score. Emma Croker scored a first-half try following Amber Reed's early penalty to put England eight points ahead. Niamh Briggs replied with two penalties before the break and a third, eight minutes into the second half, put the visitors 9-8 in front. Ireland exerted more pressure after that and number eight Harriet Millar-Mills was sin-binned for England. But the hosts survived and were able to hold their lead once Scott had scored, even though Reed missed the conversion and a subsequent penalty. The result lifts world champions England above France, who play Wales in Neath on Sunday, to the top of the table. Ireland, who have finished top in two of the last three years, stay third following their second successive defeat.